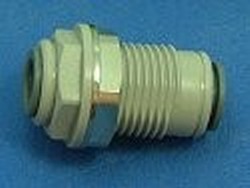 We carry more bulk head fittings than anyone on the net. 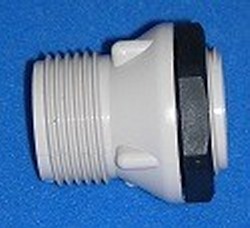 We carry more bulk head fittings than anyone on the net. It can become confusing, so take your time to review every page we have listed below. 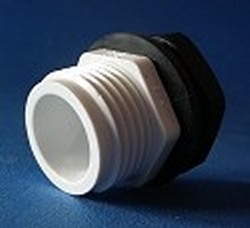 Bulkhead fittings are identified by the size of the pipe it connects to, not the hole size. The hole size will be specified in the description for each bulkhead fitting. 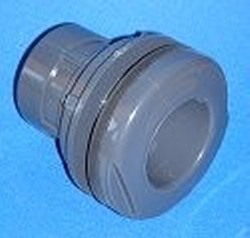 When we describe the bulkhead fitting, the first designation is the flange side and the second is the back side. ie, fpt (female npt) x slip means the flange side has a female pipe thread and the back side would have a slip socket for pipe to be glued into. Again, size always represents the pipe size that fits the bulk head, not the hole size. If you don't find the size bulkhead fitting you want in one category, look in some of the others. 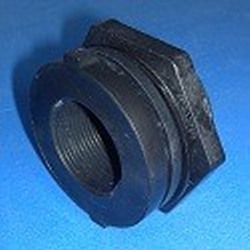 All bulkhead fittings come with at least one gasket and one nut unless stated otherwise in the description. Extra nuts and gaskets are available at the link near the bottom of this list. 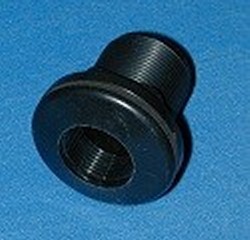 Economy Bulkhead fittings 1/2" to 2" - Made in the USA! These economy ABS & PVC bulkhead fittings are available in 4 different configurations: Slip x slip, slip x fpt, fpt x slip and fpt x fpt. Sizes available are 1/2", 3/4", 1" 1.5" and 2". All are black in color. ON SALE! Sch. 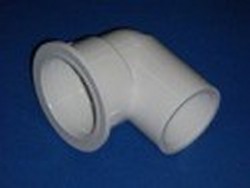 80 PVC Bulk Head fittings - These are all potable water rated, sch 80 fittings. Sizes available are 1/4", 3/8", 1/2", 3/4", 1", 1.25", 1.5", 2", 2.5", 3", 4", 6" and 8". (Special order on some sizes, if you click on this link and don't see the size you need, email us for details) All gray PVC. Quick Disconnect (QD) 150PSI Modular PVC Bulkhead Fittings & Support Parts. Approved for potable water. These bulkheads fit 1" and 1.25" holes in materials up to 1/16" thick. 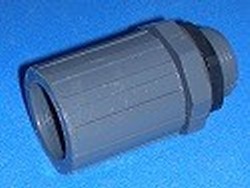 For use with 1/2", 3/4", and 1" hose or 3/4", 1", and 1.25" PVC pipe. If you want the job to have a professional industrial look, these are the fittings for you! Screens for bulk head fittings: Grates, Flat and Vertical Screens for bulkhead fittings. Again, take special care here, not every part here fits all the different bulk head fittings we sell. Email if you have questions. Low profile, light duty bulk head fittings. Low Profile. In PVC, Non-rated fittings. 1" and "almost 2.5" only sizes available. White in color. Barbed Bulkhead Fittings. Available in 1/2", 3/4" and 1". Barb on the nut side, sch 40 slip socket on the flange side. 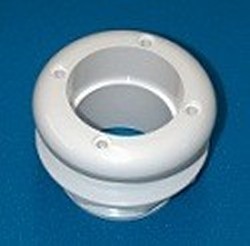 Uniseals are essentially well engineered grommets for tank and drums to allow Sch 40 and Sch 80 pvc pipe to go thru the Uniseal into the tank or drum. Works on most tanks and drums with a thin wall. (less than 1/4"). Stocked in sizes 1/4" up to 6" PVC Sch 40/80 pipe. 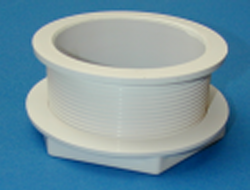 Polypropylene fpt (female npt) reverse (left-hand) thread Bulkhead Fittings. 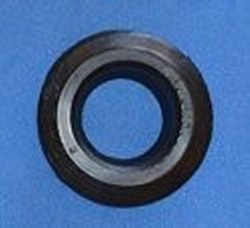 In Poly, 1/2", 3/4", 1", 1.25", 1.5", 2", 3" and 4". All come with 2 gaskets (1 hard, 1 soft). Black in color. Extra Nuts, 90 degree nuts, gaskets, tools, and parts for bulk head fittings. Be careful on this page. While it has a lot of different items, not everything here works with every bulkhead. Email if you have questions. One off, obsolete, old style, discontinued medium and heavy duty bulkhead fittings (aka tank adapters). Some unusual, discontinued, obsolete, etc bulk head fittings. Most ABS, a few PVC. Rated and Non-rated fittings. Sizes include 1/2", 3/4", 1", 1.5", and 2", some having several different styles of each size. Many odd-ball and one of a kind bulkhead fittings here. Some in black and some in white. Custom Made Extra Long Bulkhead Fittings Extra Long. The pipe sizes will be the same as above fittings, just you can order longer lengths for very thick walls or bulkheads.